Noticia relacionada a premio otorgado a Valerie Méndez-Gallardo, quién formó parte del Programa COR de nuestro instituto y quien en la actulidad trabaja como profesora asistente del Departamento de Psicología en Penn State Brandywine. Muchas felicidades a nuestra egresada. 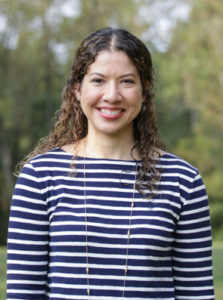 Valerie Mendez-Gallardo, assistant professor of psychology at Penn State Brandywine, was recently awarded the 2017 John Romano Faculty/Staff Diversity Recognition Award. Presented by the University’s Multicultural Resource Center, the award honors a Penn State faculty or staff member who goes above and beyond their job responsibilities to consistently promote multiculturalism and demonstrate concern for and sensitivity to the needs of multicultural students. Lightfoot explained that Mendez-Gallardo is an advocate for Brandywine’s multicultural students and has become a mentor to many of them. “In addition to the fact that she seeks out more formal opportunities to contribute to our diversity initiatives, Valerie also has ongoing, daily interactions with students, faculty and staff that touch on issues of diversity. She lives and breathes it,” said Lightfoot. Both Lightfoot and Mendez-Gallardo emphasized the importance of diversity in academics.